Paul Wing (1996), Stereoscopes: The First One Hundred Years p. 41-42. This very decoratively carved version is described by Wing as the deluxe model. 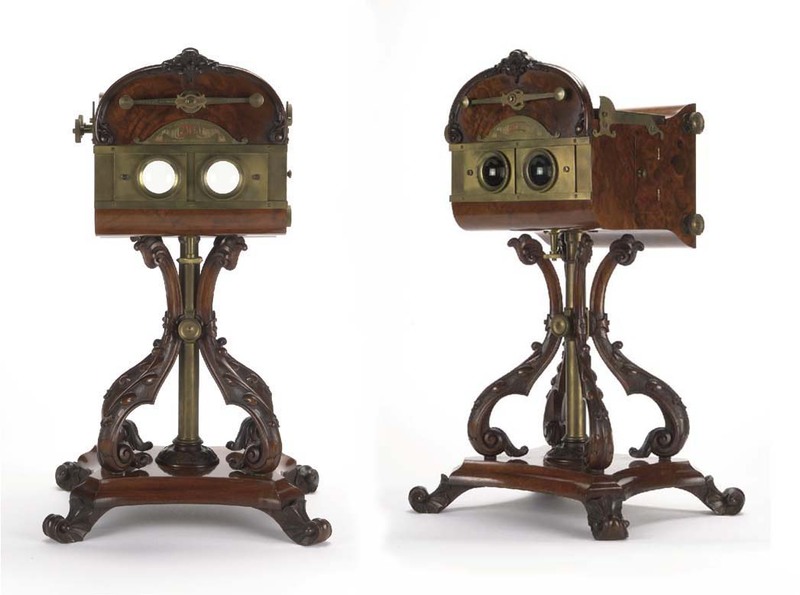 There are believed to be fewer than twenty surviving examples of the Natural Stereoscope. 'The object of the improvements is to neutralize the granular, fibrous, and general coarseness of objects seen through stereoscopic glasses, especially when high magnifying powers are employed, and also to produce various changes of effect to such objects. Tinted, transparent, or semi-transparent media are so applied that the light falling on the front of the picture may pass through them without intercepting the vision, When the picture is transparent, the said tinted media may be applied in combination with other tinted media at a short distance behind the picture. Sir David Brewster exhibited an example of the Natural Stereoscope on 9 February 1864 to a meeting of the Photographic Society of Scotland where it was described: 'Its peculiarity consisted in having an apparatus by which various coloured screens could be introduced behind the transparent picture changing the effect from cold to warm or from sun to moonlight'.